Wherever there is a prolific source rock, our industry has developed the technical capacity to move away from ‘conventional reservoirs – whether sandstone or carbonate – with good porosity/permeability characteristics, and extract petroleum wherever it is ‘reservoired’. The North American industry has been leading this charge, notably on ‘tight gas’ and shale oil/gas of course. 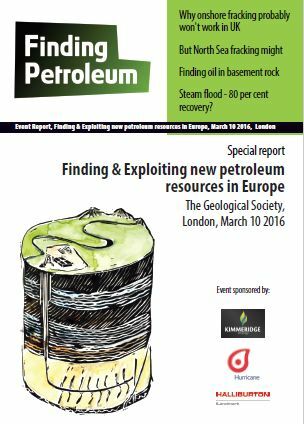 Where are the world-class source rocks that will deliver new resources in – or close to – Europe? Is there an extensive fractured ‘basement’ province West of the Shetlands or is the main recent discovery (Lancaster) of this type a one-off? ‘Heavy’ oil is abundant in the North Sea. What do we have to do to get it ‘moving’? What needs to happen to move the many smaller discoveries in the North Sea from uneconomic or ‘marginal’ to developable? What needs to change so that we can explore for and exploit ‘shale oil or gas’ resources in Europe, instead of just talking about it? This event will attempt to answer these questions, and others, to indeed bring deeper knowledge, to perceive the wider opportunities. Please get in touch with me if you have something to say! Please contact Richard McIntyre if you would like to sponsor or exhibit. He was formerly Director of Research at Kimmeridge Energy and is responsible for private investments, particularly outside the US, and for developing Kimmeridge’s geological research and screening capabilities. Prior to this role, Dr. McMahon was a Senior Equity Research Analyst for the Global Integrated Oils at Sanford C. Bernstein, where he was ranked 1st in the 2009 Institutional Investor Survey, for the third time. Dr. McMahon covered 18 of the largest integrated oils and refiners. He joined Sanford C. Bernstein in 2002. Before joining Sanford C. Bernstein, Dr. McMahon was an Engagement Manager at McKinsey, based in both Houston and London, where he had been since 1999. At McKinsey he mainly advised petroleum and electric power and natural gas clients and undertook proprietary research within McKinsey’s industry practices. Prior to McKinsey, Dr. McMahon worked in the oil industry as a geoscientist with British Petroleum (BP) and British Gas (BG) before moving into consulting with Arthur D. Little where he became a manager in its Global Energy Practice. Dr. McMahon received an honors degree from The University of Edinburgh in Geology and Geophysics where he later undertook further research to complete a BP sponsored Ph.D. in 1995. Dr. McMahon has also published a number of technical and management-oriented papers in leading oil and gas industry journals, and currently sits on the board of Durham University’s energy research group. Founded in 2012, Kimmeridge Energy invests directly in unconventional oil and gas projects and assets, primarily in North America. The Kimmeridge team consists of investment professionals with deep industry relationships and an in-house operating team with considerable experience in geologic evaluation, land acquisition and engineering. Kimmeridge Energy maintains offices in New York City, Denver and London. For more information about Kimmeridge Energy, please visit the Company's web site at www.kimmeridgeenergy.com. The Carboniferous basins of the UK initially developed in an extensional setting, and include a wide range of depositional environments. They go through a distinct evolutionary pattern, from isolated shallow marine basins with carbonate platforms, to deep water organic rich depocentres, to over- and under-filled clastic margins with prograding deltas, and finally to coal-rich swamp environments. Each extensional basin within the UK onshore has its own distinct characteristics with regards to how the basin filled, and the nature of this basin fill has implications for the development of source rock across the UK, and hence the prospectivity of Carboniferous extensional systems in the onshore. As Hurricane’s founder, Robert has over 25 years’ oil industry experience. He has combined specialist technical expertise in fractured reservoirs’ characterisation and evaluation. He has a PhD in Geology from Birkbeck College, University of London and gained the bulk of his geoscience experience with Enterprise Oil and Shell. He has worked in field development, exploration, well-site operations and geological consultancy. Robert has held the position of Visiting Professor at Trondheim University (Norway) and has published and presented on subjects related to fractured reservoirs and exploration for stratigraphic traps. It is Robert’s vision that lies behind Hurricane, providing clear strategic direction as the company develops and he takes the lead in all aspects of the scientific and technical heart of the company. Hurricane is a new generation of oil company that exists to discover, appraise and develop oil from fractured basement reservoirs. We have an experienced team of experts in basement reservoirs. Between us, we have spent decades in the oil industry. Hurricane has discovered more oil in the UK in the past ten years than any other company. We can do this because we look at things differently to other oil companies. We are innovative, pioneering and creative. Technically led and driven, we use our niche expertise to find oil where others have looked but not seen. We exploit discoveries and we help to realise the value of those discoveries. We are a company with a small team of staff, operating to the highest corporate standards but with a minimum of bureaucracy. Steve Brown is a founder and the CEO of The Steam Oil Production Company Ltd. He is a petroleum engineer with over thirty years of experience. He has a degree in Chemical Engineering from Peterhouse, Cambridge and started his career as a petrophysicist with BP. At BP he worked on Forties Bravo and the development of Harding and Andrew as well as in BP's corporate planning department. He has also worked for Halliburton and Petrofac as well as founding Challenge Energy, Exile Resources and Setanta Energy. The Steam Oil Production Company Ltd was established in early 2014 with the intention of initiating the first offshore steam flood in Europe. The company participated in the 28th Seaward Licensing Round and in November 2014 was awarded blocks 21/27a and 28/2a under Promote Licence P2244. In December 2015 the company entered into a sale and purchase agreement with EnQuest Britain Ltd to acquire blocks 28/2b and 28/3b, which comprise Licence P1996, the transfer of this interest remains subject to Oil and Gas Authority approval.